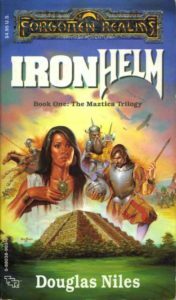 Ironhelm – Let's Read TSR! Welcome, readers, to a particularly baffling and bizarre period in the Forgotten Realms’ history. At some point after the release of the Grey Box campaign set, someone at TSR decided that having a successful fantasy world was all well and good, but what the setting really needed was to be more like the real world, with fantasy versions of Aztecs, Chinese, Mongols, Tibetans, Japanese, etc. which were exactly like their counterparts in reality but with more magic. The Realms duly gained an unexplored jungle continent across the sea to the west, a bunch of new nations across a huge steppe to the east, and two trilogies of novels to introduce them. I can’t fathom the chain of logic which led to that decision, but it would have been fascinating to be a fly on the wall during those brainstorming sessions. The upshot of all this is that I sure hope you like historical fan fiction, because the next two trilogies are all stories about thinly-veiled duplicates of real-world cultures and events. I’m going to have to grit my teeth to slog through it, I think — especially since this first one (the Maztica trilogy) was written by Douglas Niles, whose work on the Moonshae trilogy didn’t particularly impress me. I can’t speak for everyone, of course, but to me this all seems like a dreadful idea. We play fantasy role-playing games and read fantasy literature to get away from the real world, to enjoy exploring things outside of our regular experience, and to let our imaginations run wild. If your fantasy slavishly imitates the familiar, is it really fantastic? Or does it just become history with a paper-thin veneer of the unusual, bereft of imagination? I guess we’re about to find out. Maztica, the new unexplored land across the Sea of Swords, is a straight copy of Central America in every possible respect. Amidst lush jungles full of colourful parrots and fierce jaguars, the locals build terraced farms and stepped pyramid temples in which they sacrifice captives to their bloodthirsty gods. All the character and place names (Erixitl, Kultaka, Zaltec, etc.) are clearly designed to sound like Aztec names. Obsidian swords, feather cloaks, jaguar masks, feathered serpent gods… it feels like they just transcribed a couple of textbooks on Aztec culture and changed a few of the names. The only addition is their unique indigenous system of magic, with good feather magic (pluma, representing wind and life) and evil talon magic (hishna, representing blood and death). There’s actually a decent twist in all this, though, with the reveal of the truth about the “Ancient Ones” who control the priesthood of Zaltec. 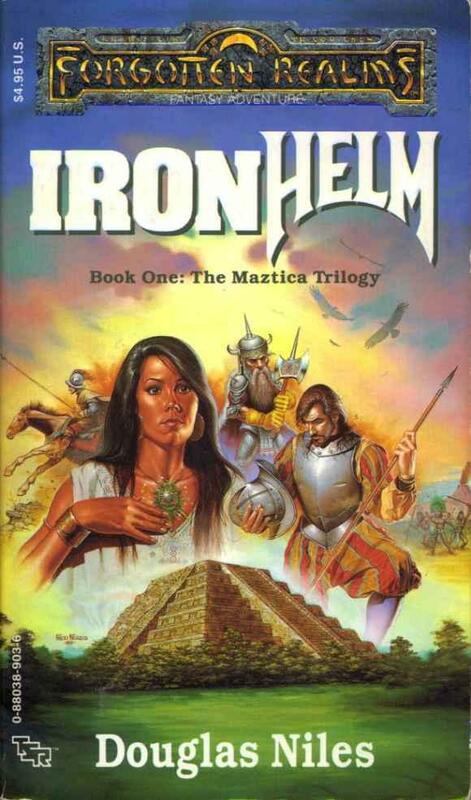 Done well, it could have added some spice to the otherwise straightforward retelling of the conquistador story. But the twist is foreshadowed too heavy-handedly; odds are you’ll have worked it out for yourself by the halfway mark. And it makes the natives even less impressive; now, instead of being a powerful empire in their own right, it turns out they’re being duped and used as tools by a more cunning and dangerous faction. They just can’t catch a break, can they? The passing of an empire and a people can be a gradual thing, measured not in days nor years but in generations and centuries. Yet the waning of the Nexala, by this scale, becomes a sudden and cataclysmic plummet to disaster. Unsurprisingly, the violent collapse of the empires of Maztica is dwelt on at length, with the first third of the book describing a variety of disastrous portents and omens which the native gods show to their worshipers. It’s a good theme, but we see very little of the effect of this collapse on anyone who isn’t a priest or noble, which makes it less poignant. One of the few solid scenes in the book is where one of the protagonists shares a hut and a meal with a peasant lady; she’s worried about her husband and son who have gone off to fight the foreign invaders. If there’d been more bits like that and less priestly bickering, the fall of the empire would have had much more pathos. She knew that she could no more choose to go to Nexal than could a piece of driftwood select the beach upon which it would land. She’s the audience’s window into Maztican culture, a young slave girl who’s especially favoured by the god Qotal, the Plumed One. (Basically your Quetzalcoatl expy.) But she spends the entire book being helplessly pulled from one dire circumstance to the next — the classic Pinball Protagonist — and is always rescued from them by coincidence or divine intervention rather than by her own actions. Our other protagonist is Captain Halloran, leader of one of the expedition’s military units. He’s basically your traditional Mighty Whitey colonialist protagonist, a trope as old and tired as colonialism itself. This particular instance is the same protagonist mold that we’re all familiar with from movies like Dances with Wolves, Pocahontas, and Avatar: a white man encounters a native culture and falls in love with a native girl. Relations with the natives are rocky at first, but eventually he proves himself, everyone learns valuable lessons from one another, and in the end he turns on his own people to help the natives. That way, nobody gets overtly offended: the natives get to be noble savages, the villain can be white, and the white people consuming the media can think “Well, white people aren’t all bad! Look how great this hero guy is!” and take away a stealthily positive message about colonialism. Unfortunately, Halloran has little more agency than Erixitl does. Again, nearly everything that happens to him is the result of coincidence or divine intervention rather than his own decisions. Even their romance feels like the inevitable result of tired tropes rather than a genuine relationship between two well-rounded characters. It’s the sort of story where, when you see a morally upright white colonizer with wavering loyalty to his cause meet a simple, honest native girl, you know with a sinking certainty that the author’s going to have them get it on before Act Three as part of the whole “learning cross-cultural lessons” schtick. The really sad thing is that as audience surrogate characters go, Halloran isn’t even all that likeable. Erixitl’s scenes were at least fun to read; she’s smart, pragmatic, and defiant, and although none of her attempts to direct her own fate actually work, at least she tries. Halloran doesn’t even make a moral choice to side with the natives against his people — the Legion imprisons him because they blame him for getting someone killed, and he has to run away. He’s mostly just a generic beefcake character: none too bright, short on distinguishing personality traits, and without much interest in learning the language or customs of the natives who are helping him. On the other side, the native villains are the high priests of the evil Maztican god of war, who are extremely keen on cutting people’s hearts out. Just to make sure that we don’t forget that they’re evil, they use human blood for hair gel to spike their hair in crazy ways. Ordinarily I’d give the author a bollocking for being too over the top with the ludicrously evil villainy, but that’s actually not far off from the historical record; the real-life Aztec religion was often serious horror movie material. (The priests of fertility god Xipe Totec, for instance, would wear the freshly flayed skins of recently-sacrificed human victims as ceremonial garb.) But they’re minor villains in the overall plot; as cat’s-paws to the spoilery “Ancient Ones”, they serve more as local colour than a serious threat. The shore she what now? It’s got some very strange issues with pacing, where interesting scenes will be interrupted for no apparent reason to focus on some other character doing something comparatively boring, like travelling from point A to point B. A good example is near the end of the book, when Halloran and Erixitl are in a pitched battle with a pack of hellhounds. Suddenly there’s a cutaway to another character meeting a cryptic stranger, and then someone else goes and sits on top of a pyramid and waits for a while, and then eventually it gets back to Halloran and Erix fighting for their lives. I’m all in favour of having cutaways between multiple plotlines, but there’s a time and a place for that sort of thing, and that wasn’t it. There’s some interstitial material that’s presented in the form of excerpts from a book that one of the Maztican priests is writing to record the downfall of their civilization. They’re generally good; the priest has a broader perspective on events than any of the individual characters, which is very welcome given how little knowledge or agency any of the other characters have. On occasion they end up being tiresome recaps of the material you just read, but those are the minority in this book. As explorations of European colonialism go, this is definitely no Heart of Darkness or A Passage to India. The characters are mostly flat, the writing is acceptable but not noteworthy, the plot twists are ham-handedly telegraphed, and the entire conceit is just too historical and insufficiently fantastical to feel like a proper Forgotten Realms novel. Ironhelm has its occasional good moments here and there, but they can’t disguise the fact that there’s just so much wrong with this book. The one thing it really has in its favour is its depiction of a non-medieval-European fantasy culture — but unfortunately, since the world-building is all copied straight from a familiar real-world culture, it lacks the satisfying flavour of real imagination. Still, at least it’s a stab in the direction of something a bit less Tolkieny. Later it would even acquire an Australia analogue, complete with fictional counterparts to the Aboriginal people — but that wasn’t until the 2000s, when they were running very low on ideas. Toril had recently gained an Orient with the release of the Kara-Tur: The Eastern Realms sourcebook in 1988, about a year and a half after the release of the Grey Box. Given how little tied this new material to the rest of the Realms, and that none of the authors had written any Forgotten Realms material before, one can’t help but suspect that it was a bunch of setting material for the 1985 Oriental Adventures sourcebook which was transplanted to the Forgotten Realms once the setting became successful.